According to the Panama Papers, two Russian businessmen used an offshore company to borrow more than € 5 million for a winery they own in Chisinau. Documents compiled by the offshore services firm of Mossack Fonseca show the two set up a company in the British Virgin Islands. The point of such a transaction would be money laundering, according to an expert consulted by RISE Moldova. Connected to the alcohol market in the Russian Federation and the breakaway region of Transnistria, in recent years the Russians have moved several businesses to tax havens, including the Moldovan winery, Vismos. According to the Panama Papers, two Kyrgyz brothers are the real owners of Aroma Trade House, hidden behind a network of offshore companies. Pavel and Valeriy Zadorin do business primarily in the Russian Federation, appearing as shareholders or directors in dozens of companies active in the real estate or alcohol market. In 2005, three years after Vismos was privatized, it concluded a loan agreement with Palmer Equities Ltd., an offshore from the British Virgin Islands (BVI). In subsequent years, the Chisinau winery signed two similar agreements with the same company. The total amount borrowed from Palmer comes to € 5.4 million. Palmer Equities Ltd. was registered by the Mossack Fonseca law firm in 2002. In 2005, its ownership was equally split between two companies from Cyprus: Busson Ltd. and Serilnit Ltd. In April of 2012, Vismos shareholders decided to start paying down the debt by issuing shares totaling 22 million lei (US$ 1.1 million) to Palmer Equities Ltd. A month later, the operation was registered by the National Commission of Financial Markets (NCFM) of Moldova, nearly doubling the share capital of the wine factory from 29 to 51 million lei (US$ 1.4-2.5 million). RISE reporters sought responses from Pavel and Valeriy Zadorin, Vismos employees and legal representatives of Palmer Equities. All declined to comment. Ina Sovetova, who holds a power of attorney to represent Palmer Equities, did say: I, as a lawyer of (Vismos) cannot discuss this without the consent of my superiors. This is not about money laundering, because the loan contracts were approved also by the National Bank. Why they took the money from, specifically, this offshore, I do not know, but the loan was motivated by the need of current assets. It was a very difficult situation, we took loans from the bank as well. Even today, due to the embargo imposed by Russia, it is not easy, but we survive. Meanwhile, the Zadorin brothers and their partner, Grigorij Kail, relocated their shares of Aroma Trade House offshore. Thus, in early 2015, Aroma Trade, which owns 56 percent of Vismos, was taken over by a Cypriot firm, and its ultimate connections go through another firm from BVI to the same Palmer Equities Ltd. When Aroma Trade bought Vismos, it promised to invest more than US$ 3 million by 2007. Records indicate that it met that commitment. In the same period, however, the winery concluded the first two loan agreements with Palmer Equities. A report by the Court of Accounts in 2010 shows that although “Aroma Trade House made investments of its own funds,” at the same time it took out loans without notifying the authorities about the scope and terms of the loans, as required by the sale-purchase contract of Vismos. “In fact, in 17 cases of obtaining loans, the joint stock company in only two cases informed the seller within the deadlines,” the court’s auditors wrote. In other cases the company waited as much as a year before notification, the auditors said. 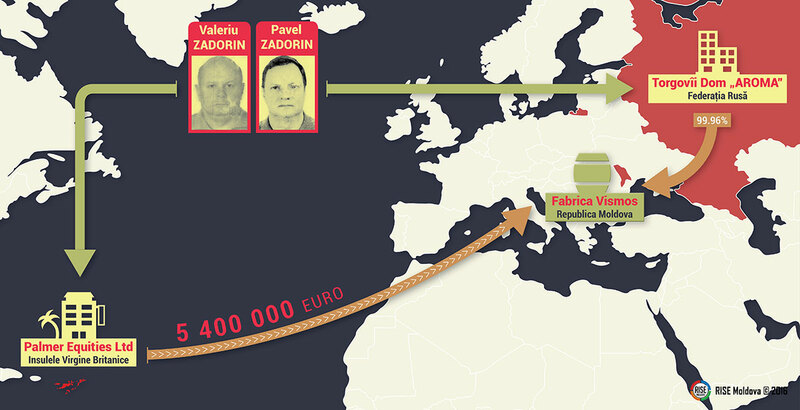 Before they bought Vismos, the Zadorin brothers were active in the alcohol market from Transnistria. Aroma Trade, in the early years of the 2000s, was the exclusive distributor of Kvint wine and brandy products (made in Transnistria) in Russia. Transnistria is a disputed territory of about 500,000 people on the eastern side of the Dniester River along Moldova’s border with Ukraine. Since a brief war with Moldova in 1992, it has operated as an unrecognized state with its own institutions, although it is officially still part of Moldova. The year 2006 was actually the end of business in Transnistria for the Zadorin brothers. In that year, the Kvint factory was privatized by Sheriff Ltd. Meanwhile, at the request of the Transnistrian Ministry of Economy, the court annulled the contract under which Aroma Trade House had obtained the exclusive right to distribute Kvint products in Russia. 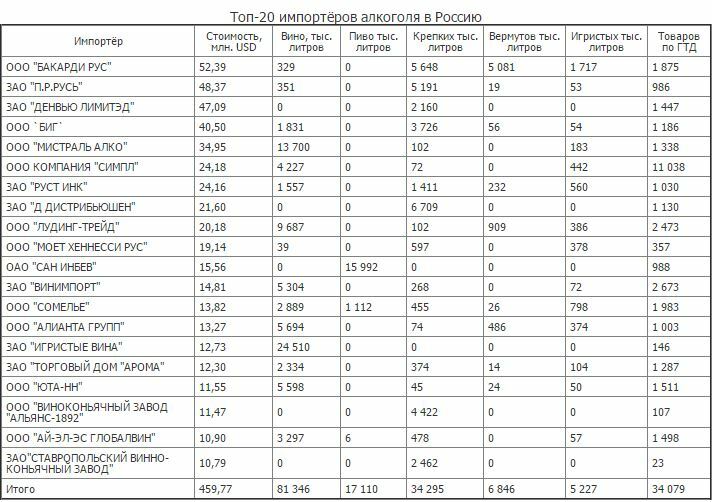 Furthermore, at the request of Transnistrian officials, local judges annulled the transactions on the sale of Kvint-Market shares to the offshore and ordered the return of 50 percent of the shares to the Kvint factory. Today, the Zadorin brothers’ businesses in Transnistria are just a memory. The factory, however, still manufactures “Zadorinka” vodka, named for them. According to Simion Leva, a member of the board of directors of Vismos: I believe that the vodka’s name is a success. It was invented long ago, in the (early) 2000s, when they (Zadorin brothers) still worked with Kvint. The people at the factory decided that since we are working with Zadorin, why not produce a vodka with the same name! ?